A Tactical Mission (TM) Pack with 1x Tactical Mission (a.k.a. Campaign Game) + 5x Scenario played on a historically based (24½”x 32″ with 1″ hexes) map of the Le Mare-Le Carillon Nose feature, located two-miles north of Saint-Lô, France. 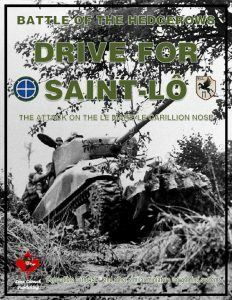 This TM revolves around the efforts of the US 35th “Santa Fe” Division’s attempts to capture the ancient city of Saint-Lô. 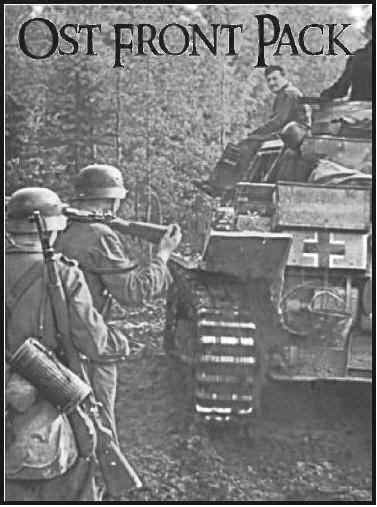 Standing in their way is the battle-weary Germans of Kampfgruppe Kentner, 352.Infanterie-Division. This TM is compatible with MMP’s ASL™ System and modifiable to be used with other miniature Wargaming systems. DSL-1 Le Petite Ferme: Company E, 2d Battalion, US 137th Infantry Regiment is tasked to capture a small farmhouse. Suspecting that it was abandoned or held by a few Germans, Company E advanced toward the stone farmhouse, when a machine gun let loose, spraying bullets into the hedgerows in front of the Americans. A small 5-turn scenario featuring, Germans: 6x Squads, 2x Leaders, HMG, and some fortifications; Americans: 7x Squads, 2x Leaders, 2x MMG, 2x Baz, and 2x M-10 GMC. DSL-2 The Right Nostril: With the capture of the Le Petite Ferme, Kampfgruppe Kentner fell back to its next line of defence, astride the east-west lane from la Mare to Le Carillon. After clearing out the farmhouse and the surrounding buildings, Company E reinforced by Company G continued its advance. The Americans using the tactic of putting down heavy concentrating of fire on suspected German positions and then clearing them with small groups of men, proved time-consuming. A medium 7-turn scenario featuring, Germans: 5½ Squads, 2x Leaders, 2x MG Bunkers, & A-T Gun; Americans: 9 Squads, 3x Leaders, 2x Baz, 2x HMG, 2x 81mm Mortars, & 2x M4 Shermans. DSL-3 The Left Nostril: As the 137th Infantry Regiment struggled forward on the right, on the American left flank, the 320th Infantry Regiment was moving forward behind a creeping barrage. The Americans had hoped that the enormous amount of firepower, supplemented by fighter-bombers attacks would overwhelm the Germans. However, the Germans were well dug in and well protected, so that when the barrage advanced passed, the Germans came out of the bunkers, remanned their weapons, and waited for the Americans to come into view. A medium 7-turn scenario featuring, Germans: 8x Squads, 2x Leaders, 3x MG Bunkers, 2x 81mm Mortars, & fortifications; Americans: 11½ Squads, 3x Leaders, 2x MMG, 3x Baz, 3x 60mm Mortars, & 2x 81mm Mortars. DSL-4 La Mare-Le Carillon Nose: The American attack kicked off a 08.00 hours, from the start, the advanced proved to be time-consuming with heavy casualties. The Germans, were using the terrain skilfully and to the best of the their advantage by setting up defensive line after defensive line to effectively slow and in some places stop the Americans’ advance. But as the afternoon waned, the Americans had managed to fight their way to top of the “Nose”. One more pushed would surely be enough to capture the high feature. A medium 7½-turn scenario featuring, German: 11½ Squads, 3x Leaders, 2x MMG, 2x Psk, 3x MG Bunkers, 3x A-T Guns, 2x 81mm Mortars, & 2x Marder III(t)M; Americans: 11½ Squads, 3x Leaders, 2x MMG, 2x, HMG, 3x Baz, 3x 60mm Mortars, 2x 81mm Mortars, & 4x M4 Shermans; with Artillery & Air Support. 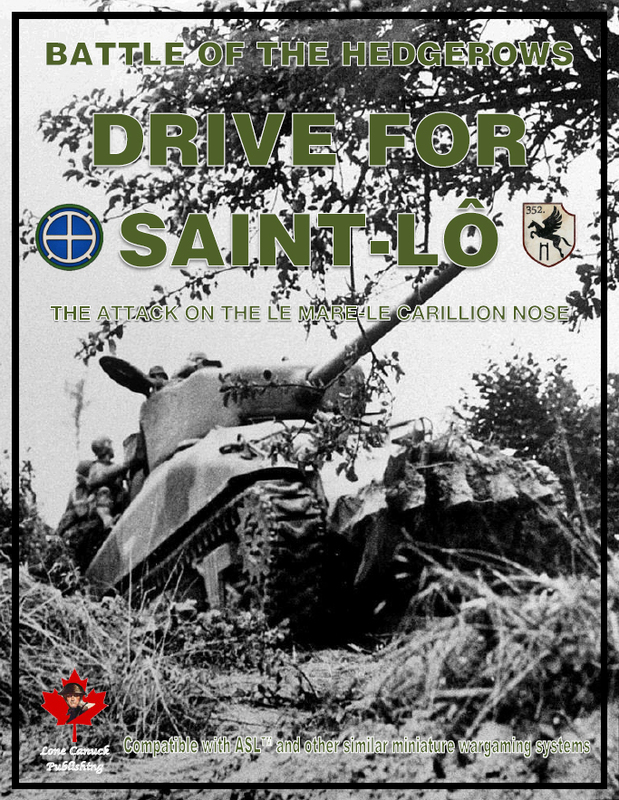 DSL-5 The Drive for Saint-Lô: The BIG scenarios of the module, for those who don’t want to play the Tactical Mission (Campaign Game), this scenario covers the entire map. A large 10-turn scenario featuring, German: 13x Squads, 4x Leaders, 2x MMG, 4x MG Bunkers, 2x Psk, 3x AA Guns, 3x A-T Guns, 2x 81mm Mortars, 2x StuG IIIG, & fortifications; American: 30x Squads, 7x Leaders, 6x MMG, 6x HMG, 6x 60mm Mortars, 4x Baz, 4x 81mm Mortars, 4x M4 Shermans, & 4x M10 GMC; with Artillery, & Air Support. This is an unbelievable amount of ASL for only $27! The 5 scenarios are great, but the campaign (TM) is incredibly rich! Great map, and the rules are written very cleanly. Each scenario will provide a great challenge. High quality material and printing. This is serious bang for your buck. Highly recommended! 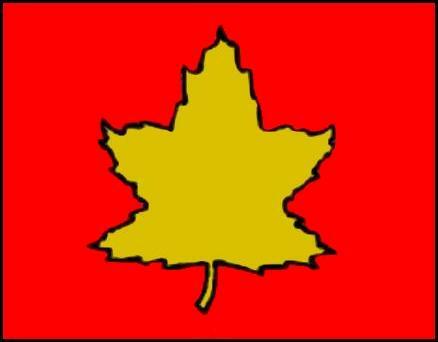 There is truly no better bang for the buck than the Lone Canuck campaign games. The quality of the components are great and the scenarios are fun but my favorite part is the campaigns. To be honest, I can’t wrap my ADD brain around managing the larger campaigns that are battalion sized. The nice thing about the Lone Canuck stuff is that you have the small scale of a manageable OB while having the long term goals of a campaign. PHD is my favorite that I have played. Hell’s Highway takes a toll on your constitution as the Americans getting completely annihilated at first and then as the Germans as your beautiful Panthers are whittled down to dirt in the end game.